Triple Bean and Chicken Stew is hearty and will warm your insides and fill your belly. 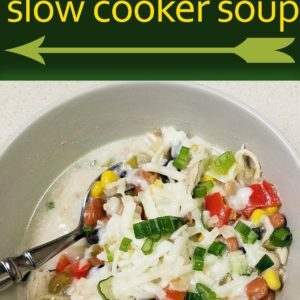 Author: Krista Prep time: 15 mins Cook time: 4 hours Total time: 4 hours 15 mins Serves: Serves 6-8 A hearty stes that will fill you up and warm you up. Perfect for chilly Fall days! Open cans and rinse beans. Pour chicken broth, green chilies and canned corn with juice into slow cooker. Add beans and stir until evenly mixed. Chop pepper and onion and add to slow cooker. Cook on high heat for 2-3 hours or until chicken breasts reach 165ºF. Remove chicken breasts and shred. Return shredded meat to slow cooker. Stir until evenly distributed. Cook on low heat for an additional hour, if desired. Stir in sour cream. Garnish with cheese and green onions.